Snowbee Fly Line Slick reduces friction on your line when passing through your rod eyes, increases line speed and protection for your line, extending its life. Top Selling Snowbee Fly Line Slick is comes with all Snowbee XS Floating Fly Lines to give a performance second to none - It is also purchased by non Snowbee Fly Line users. A silicon based fly line lubricant and when your Fly line is kept fully coated, it helps protect fly lines from damage and the effects of any harmful chemicals. 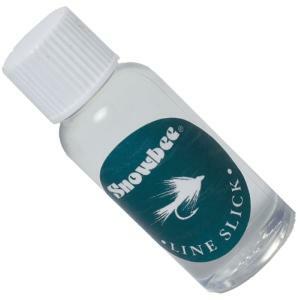 Instructions for using Snowbee Fly Line Slick. Please do not use industrial cleaners, they can contain solvents that can damage your fly line coating. In the worst instance they can cause it to dry out or even crack. 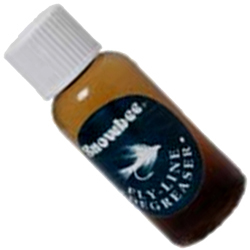 Cleaning is an important aspect of fly line longevity, Snowbee recommend cleaning lines occasionally between regular outings or, if you don't fish that often, maybe once every few months or especially after use in coloured water or if allowed to become grubby on the floor. In freshwater, microscopic particles of algae will collect dirt and other deposits onto the line. These small particles adhere to the surface of all lines but with floating lines, it can sometimes lead to the line becoming less buoyant. A dirty line will also grind ridges into rod rings which in turn, might also damage a line. Saltwater fly fishing can be particularly damaging to lines as salt will dry on the line, Snowbee recommend lines are cleaned in fresh clean water after use. If your line is not shooting so well, or the tip of a floating line is beginning to sink, it is well overdue for a good cleaning. Warm water, a few drops of a mild soap, without detergent, or even a small bar of soap and a soft rag is sufficient for cleaning a fly line. For enhanced performance and extended life, each Snowbee line comes complete with a specially formulated bottle of ‘Snowbee Line Slick' for floating lines or line 'Snowbee Fly Line Degreaser' for sinking lines. Not only will this protect the line but it will also reduce the amount of friction when passing through the line guides. Just a few drops of fluid squeezed onto a dry cloth or kitchen roll type soft paper towel is all that's required. Clean and dry the line first then just pull the line through the damp cloth, and remove any excess fluid by repeating on a dry piece of cloth or kitchen roll and then hang in large wide coils or lay down in loose coils on a sheet of clean newspaper and allow to dry fully before re-spooling. If the line is not going to be used for a long time, we recommend removing it from the reel and again storing it in large coiled loops in a dark room, or in a drawer, away from direct sunlight, dont forget to Re-Slick next time you use it. Always use this after cleaning floating lines, Very slick ! One of the cheaper line sinkants, and so worth the money. But I still have trouble sinking the line - perhaps I put it on too thickly - never sure whether it's a degreaser or sinker. When it dries up, a drop of washing up liquid gives it a workable consistency again (or failing that, water). A small 'pot' lasts a long time. Great product. Makes casting a lot easier. Very pleased.